The shedding rate of FD-67 anchor tags from L. carponotatus was significantly lower than that of FT-2 dart tags. 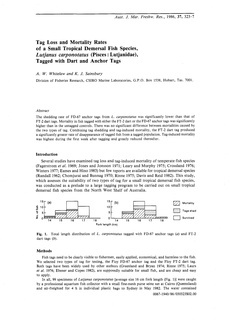 Mortality in fish tagged with either the FT-2 dart or the FD-67 anchor tags was significantly higher than in the untagged controls. There was no significant difference between mortalities caused by the two types of tag. Combining tag shedding and tag-induced mortality, the FT-2 dart tag produced a significantly greater rate of disappearance of tagged fish from a tagged population. Tag-induced mortality was highest during the first week after tagging and greatly reduced thereafter.